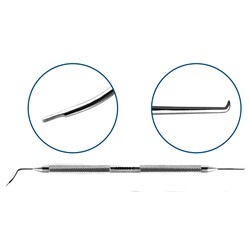 Double-ended Lane femtosecond cataract incisional spatula is specifically designed for opening femtosecond-created primary, secondary, and arcuate incisions in cataract surgery. 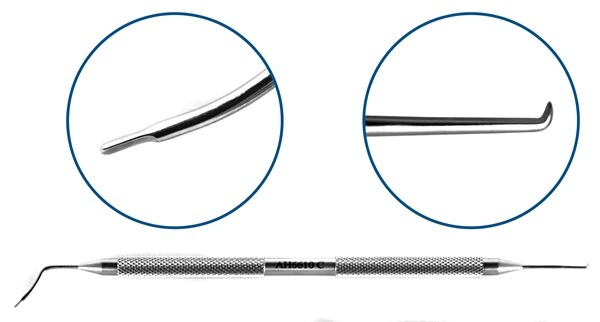 One end is used to open and spread the vertical/tangential component of the femtosecond-created incision and the other end is used to open the tunnel aspect of the incision entry into the anterior chamber. Double-ended, one-angled shaft with blunt spatulated tip, 10mm from bend to tip, max depth of 0.25mm. One straight shaft with 90-degree angle, curved spatulated tip. Round handle. Overall length: 125mm.